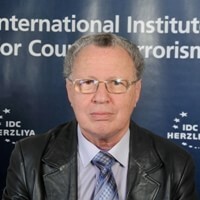 Ely Karmon is the Senior Research Scholar at the Institute for Counter-Terrorism and the Senior Research Fellow at The Institute for Policy and Strategy, both at the Interdisciplinary Center in Herzliya. He recently sat down with Haaretz to talk about what the Boston Marathon bombings and their aftermath mean for Israel, American Jews and the world. Haaretz: How many radicalized Muslims like the Boston bombers are there in the United States and Europe? "Nobody knows," says Karmon. "This is a kind of home-grown terrorism, but one that is based on the radicalization of people coming from the Middle East, Central Asia, even Southeast Asia, that exists in the United States but happens also in Australia and Europe. In the last two to three years, the U.S. has experienced at least three well-known cases of radicalization that almost ended in serious terror attacks. One was in 2009, when an American of Afghan origin was arrested when he planned huge bombings in the New York subway. In the same year, the Fort Hood shootings were more deadly than the marathon attack and were committed by an army major of Palestinian origin who killed 13 of his military colleagues at his [military] base in Texas. And he was radicalized through the Internet by the now-infamous Anwar al-Awlaki, a preacher or imam of Yemeni origin who lived for several years in the United States. Al-Awlaki was also a suspect in the 9/11 attacks, but he was freed after U.S. interrogation, and in the middle of the 2000s, he returned to Yemen to become a very important religious leader. Finally, then, there was the failed car bombing in Times Square in 2010 in which an American of Pakistani origin, someone who learned engineering and was married with children, prepared a car bombing in the heart of New York [City]. He was trained and received orders in Pakistan. The same narrative occurred in the London subway and bus bombings of July 2005. The group of four bombers was also of Pakistani origin and was trained in Pakistan. Prisons are a key focus point of radicalization and conversion to Islam. Prisons are known as a center of radicalization by specific inmates. There are cases of people who were radicalized in prison, and they represent a significant threat because these inmates are already accustomed to criminal activity, and they can pass over more easily to political violent activity. This kind of transformation from criminal to political violence is what happened in the case of some of the Madrid group, which was responsible for the 2004 train bombings." Are radicalized Muslims from the Caucasus more interested in regional issues and revenge against Russia, or are they closer ideologically to al-Qaida and worldwide jihad? "The Chechen diaspora is concentrated in Europe and not in the U.S., where there are only about 20,000 Chechens," says Karmon. "Until the Boston attack, most of the Chechen radicals’ activity was against Russia. The main leader of the Chechen rebels, DokkaUmarov, recently declared a ceasefire in acts against Russia, which thus far has been relatively respected on the ground there. And he has asked his followers not to go to Syria to fight like other jihadists and Islamists from around the world. But in the last three to four years, there has been a growing tendency to act in a more globalized jihad. For instance, in Germany there were people of Chechen origin who were involved in foiled attacks against targets in Germany and Scandinavia. There was an Arab jihadi group active in Chechnya led by Ibn al-Khattab from 1994-1995 until mid-2005, when he was killed by the Russians. So there was clear contact between some Chechen radicals and global jihadist groups. The Russians are right to stress the fact that besides the nationalist aspect of Chechens, there is also a global jihadist aspect." What threat could these radicals pose to Israel and Jewish targets in the U.S.? "We haven’t seen threats from radicalized Chechens in the past few years against Israeli or Jewish interests, although there is widespread support amongst them for Al-Qaida, jihadists and even Hamas," says Karmon. "At the end of the 1990s and the beginning of the second intifada, the Chechen rebels of the time were somewhat active on the Internet in support of radical Palestinian groups. In 1999, I saw material in which they accused Israel of supporting the Russian air force in bombing the Chechen rebels. And this was presented clearly as an argument to attack Israel and the Jews. At that time, there were specific threats against Jewish interests. At the beginning of the second intifada, the Chechen radicals offered Hamas to send 150 volunteers to fight in Gaza. This shows that they wanted to express some kind of solidarity with the Palestinians and, in my opinion, was also intended to achieve more financial support from the [Persian] Gulf countries. Other individuals show there are links between the causes: One of the Turks on the Mavi Marmara flotilla to Gaza had volunteered with the Chechen fighters in the past. In terms of Israel’s neighborhood, we haven’t seen specifically Chechen radical activity recently except in Turkey. There are Chechens living in Jordan and Chechens fighting in Syria, but they are not sent by the Chechen rebel organization led by Umarov. Therefore, it’s feasible to say that the Chechens who have decided to go and fight in Syria have been influenced by the trend of global jihad rather than the local jihad in Chechnya. And by extension, they could be involved at some point in anti-Israel activity. Likewise, in terms of the Boston bombers, I would not exclude the possibility that if these radicals are global jihadists – in the sense that they are not interested especially in the nationalist cause of the Chechen fighters – they could also look for Israeli or Jewish targets, and not only in the United States. "The activity of these kinds of radicals in the West is based on small cells, sometimes founded on family links – a strategy that was supported and categorically devised by Al-Qaida leader Abu Musab Al-Suri (his real name is Mustafa Setmariam Nasar)," says Karmon. "A very well-known leader of Al-Qaida, he was involved in jihadist activity in Spain, including the train bombings, and his 2004 book is known as the ‘global Islamist resistance call’. 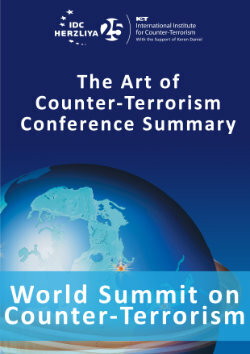 In 1,600 pages, he proposed what he called ‘leaderless resistance' strategy: Small, independent cells, radicalized by their reading of Islamist ideology, terrorist manuals on the Internet and the exchange of information in Islamic forums – a strategy that makes state surveillance and infiltration very difficult and that was adopted from the leaderless resistance strategy of American white nationalist and radical right-wing groups."